The equestrian vests models Advantage, SV2, LV, and MLV have group sizes "Small", "Medium", "Large" and the Advantage includes a "Extra" large size group. Each group is adjustable over a size range. For example the "Small" group is adjustable from XXS-S, "Medium" group is adjustable from S-XL etc. The size label list at the top the "group" size and at the bottom the actual size range for the group will read the sizes spelled out i.e. 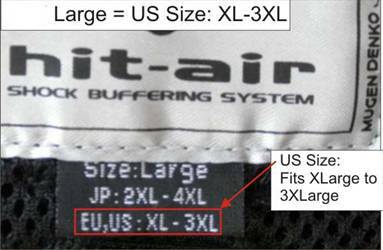 "Small", "Medium, "Large"
All models overlap in sizes either the next size up or next size down and all models are adjustable over the range of the sizes listed on the bottom label.